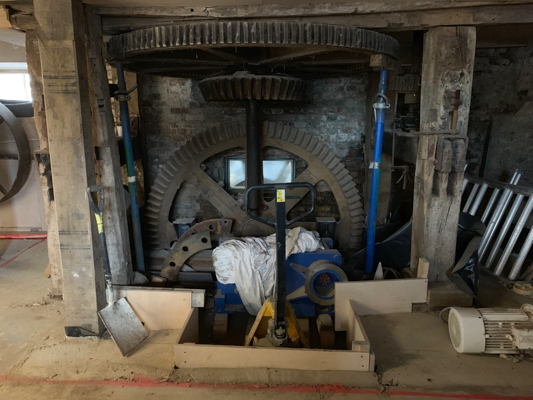 False promises of a three week turn around by a Sheffield forging company claiming to make a shaft from billet turned out to be a pipe dream; six months of nonsense, excuses, failure to communicate and false promises. Eventually we gave up calling them. They are a disgrace to Sheffield and British industry. 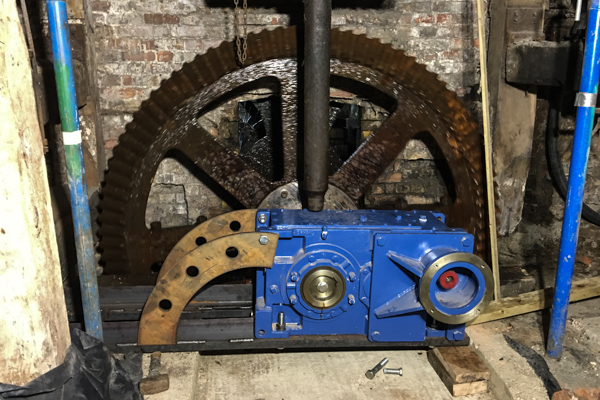 A local supplier of traction engine parts is now on the case and making excellent progress. 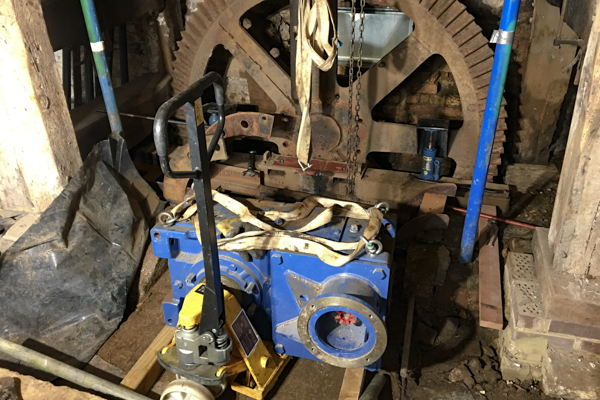 In the meantime, we're shoring up the floor around the gear box. The corn crusher has been dismantled, cleaned and re-mantled. Thanks to some borrowed muscle, it now has pride of place on the stone floor so that it can be seen from below. 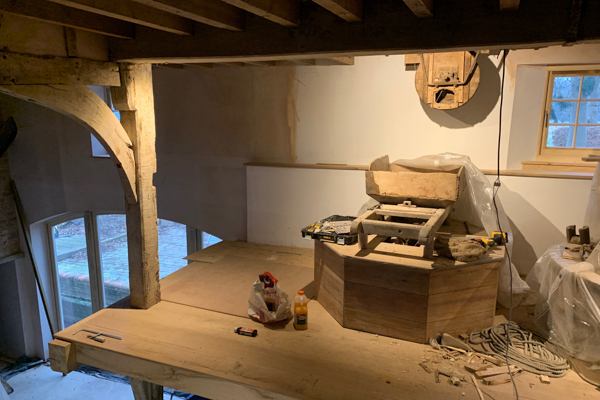 Trying out lights to work out how to make the most of the milling equipment on the stone floor. 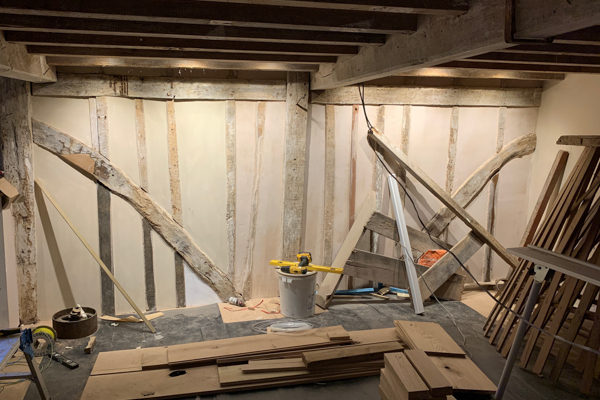 Warm white dimmable GU10 spotlights illuminate the finished “medieval wall,” modern timber repairs and plasterwork. Beyond lies the old millers office; part of the now semi-detached Flitwick Mill House and forming a brick internal wall. 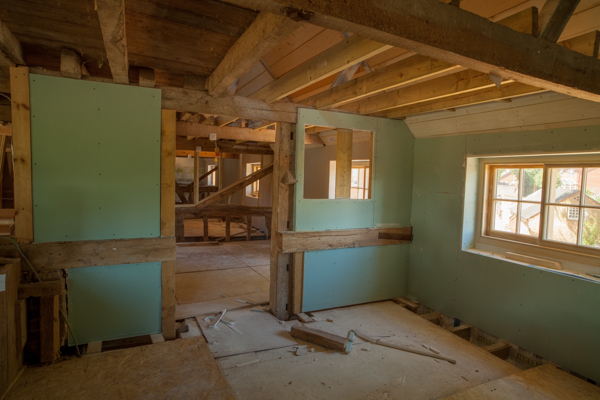 The much earlier medieval timber frame west wall of the mill is separated by 150mm of sheep’s wool and posh 21st century vapour membrane. Walls windows and ceilings come together in perfect harmony reflecting the past and incorporating the future. 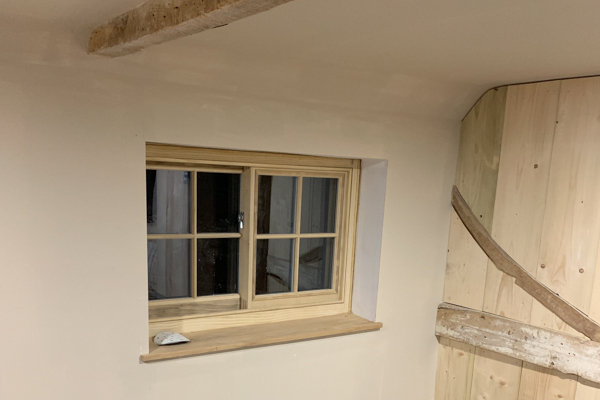 Introducing top notch insulation and modern high performance sliding sash windows with oak window boards throughout the building transforms the energy required. This is a corner of the master bedroom looking out towards the north east across the fields to Maulden. 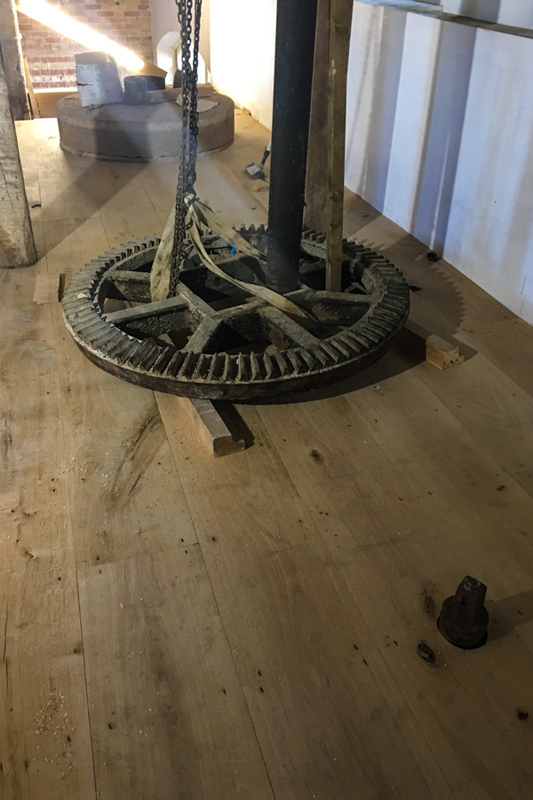 Hinge and bracket (our chippies) have worked the oak flooring around the gimbles and stones so that we can put all three sets of stones back in place once the flooring is done. 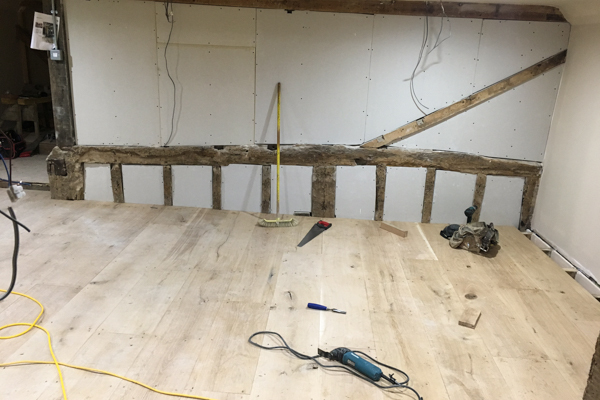 Transformation of the stone floor is well underway; the walls are finished and the stone furniture is elsewhere being refurbished. There’s a marked difference in wear on the two stones in this picture. 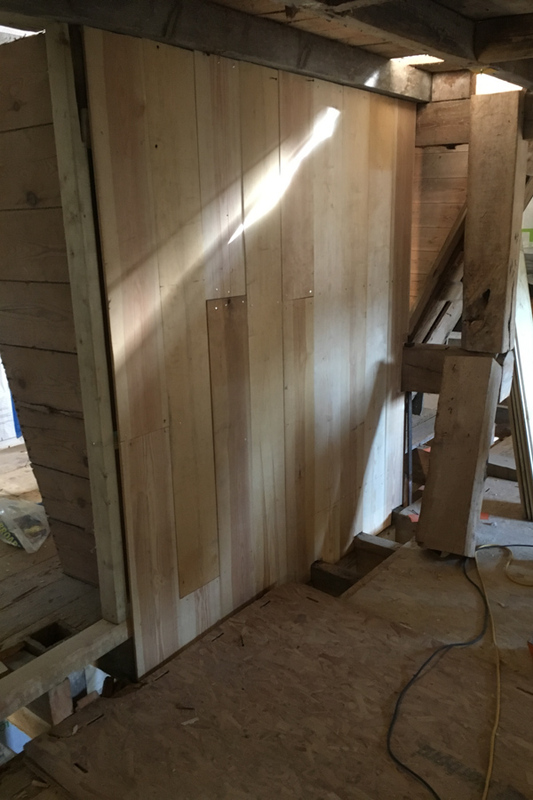 The two different wall thicknesses are evident along the back wall. Bricks below; bearing the brunt of the vertical loads of milling; together with structural and weather loads imposed upon and by the timber upper structures of the building. The inside west end wall of the older 4-bay mill. The wood lining replaces that of the Victorian grain store. The windows on the grain storage floor are new additions. Formerly the eastern extremity of the medieval 4 bay mill showing the older roof angle to the left. 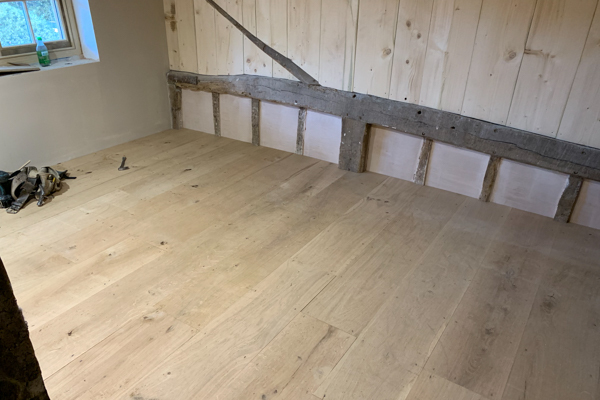 New oak flooring comprises foot wide planks and traditional cut nails. This wall formed a bin boundary when the Victorians extended the mill. Its now the west wall of the master bedroom. The raised floor with panoramic windows enables the viewer to see the structure of the building from within and from outside. The curiously different level in this area results from the early Victorian integration of two or more buildings. The much earlier four bay two storey mill is behind us in this view and we are looking east out to the SSSI of Flitwick Moor. 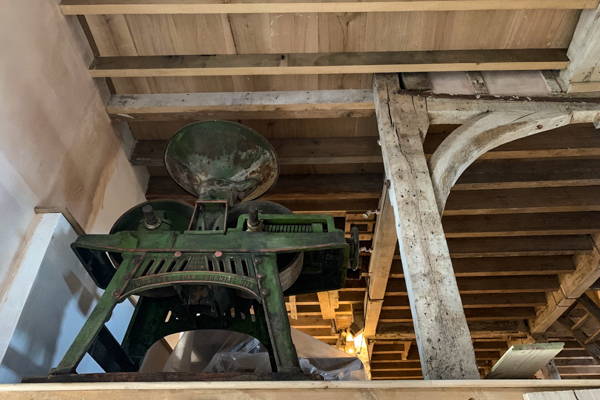 It is assumed that the raised area here represents the floor of the second storey of an adjacent corn store that was absorbed into the Victorian mill when it was extended. 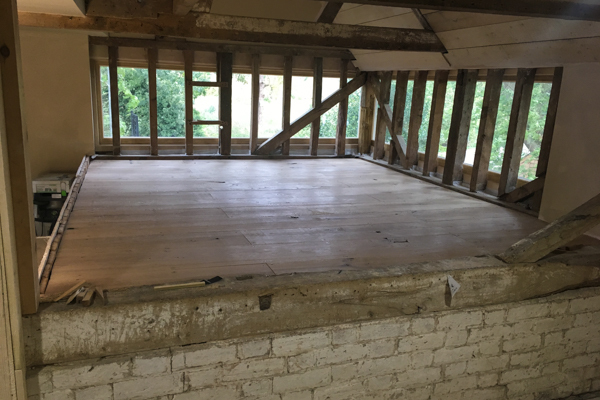 We’ve kept the different floor levels throughout and this level comprises foot wide oak planking. It’s a great place to read a book or watch the world go by. 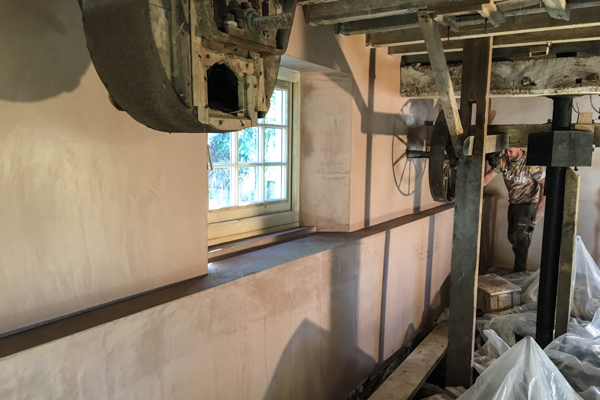 Clean plastered walls behind the stones really make the mill furniture stand out. You can see the old extractor mounted on the ceiling. It still has a Robin's nest in that we haven't cleared out yet. 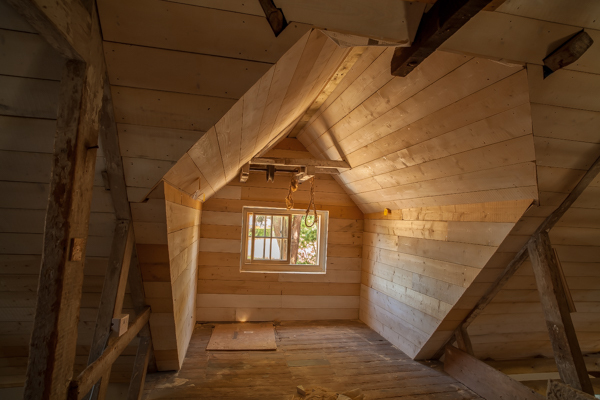 The lucum has been transformed by the new roof lining and the wooden insulation embedded within. This is work in progress and we intend to enable this whole area to be a leisure space for enjoyment of music and contemplation of the soul. It's a magical space. Master bathroom walls and floors. 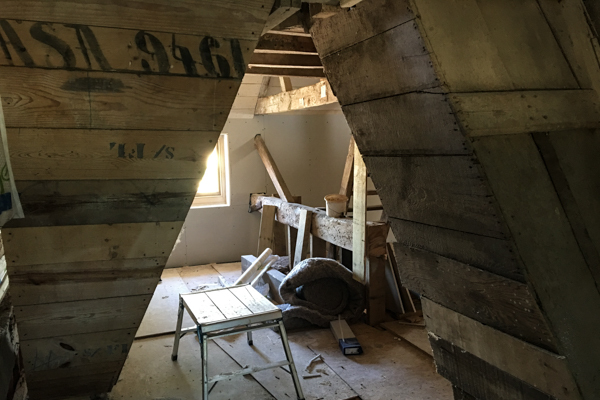 The doorway looks into the master bedroom which currently gives view through the partitions beyond each of the bays in view were each formally separated into two bins. There were no windows on the bin floor level as this was formally grain storage. One of the rooms on the bins floor has two chutes running through it making for a very wacky space. Timber linings replicate the old bins. The whole of the second floor comprised a set of storage bins that separated supplies of raw produce. There were no windows and a complete mismatch of shapes, sizes and roof heights. The storage floor held up to eighty tons of wheat in 18 compartments. Here the different floor heights are evident and we’ve replicated the materials and structure of the original materials albeit less crudely because it’s now living accommodation for humans rather than corn and the rats & mice that fed on it. We’ve also standardised as far as possible on reasonable head height and regard ourselves as sensibly short people. Two thirds of the bin floor area has been lowered about six inches to facilitate this. Sadly the driveshaft to the gearbox parted company from the flange bolted to the pit-wheel. It failed at the weld, probably because we didn’t use a shrink fit between the two. This necessitated the removal of the gearbox and manufacture of a replacement shaft assembly. Removing the gearbox was a necessity after the failure of the drive shaft. At the same time it forces us to think about future maintenance issues before we seal the area inside a glass partition. 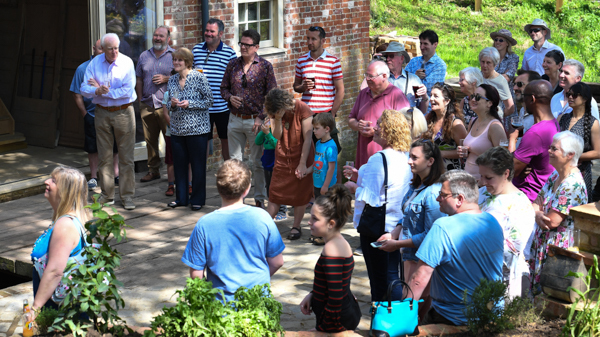 A lovely bunch folk enjoying a great launch of the waterwheel. Speech making at the waterwheel launch. 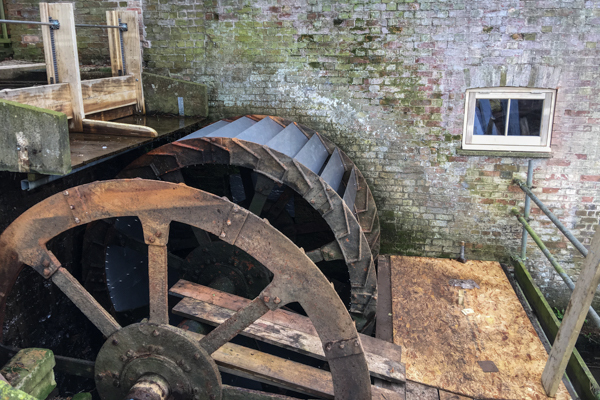 Councillor Fiona Chapman MBE graced us with her presence as she did the business of opening the sluice gates and launching the modern era of grinding electricity at Flitwick Mill. 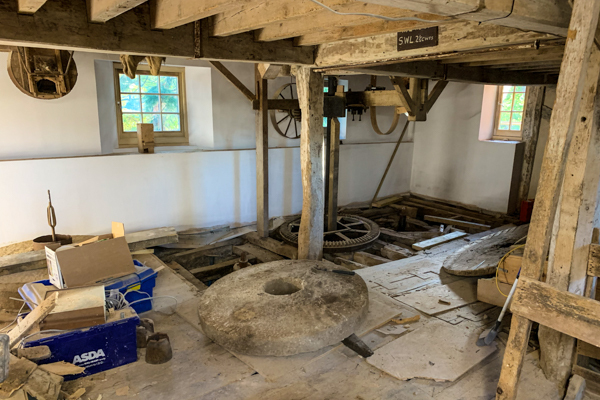 Fiona has championed the restoration of Flitwick Mill from the start and only recently confided that she really did think we were totally mad in taking on the project. Her gentle hand has guided us through all sorts of unknown and unexpected pitfalls and in her words she, “had to put her big boot in,” on several occasions. It is true that we would have found it far more difficult without her generosity and support. 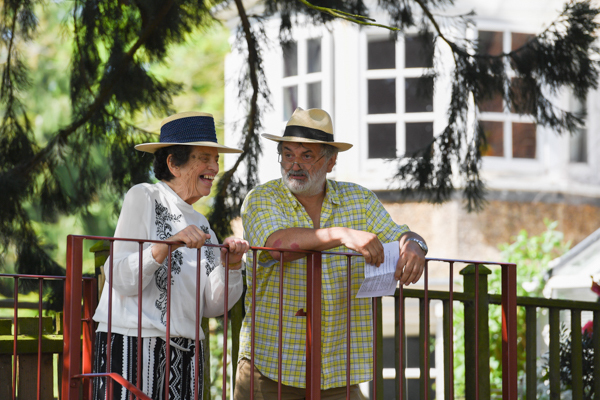 Fiona’s high moral standards have served her well during a long career supporting and championing the public wellbeing of Bedfordshire. 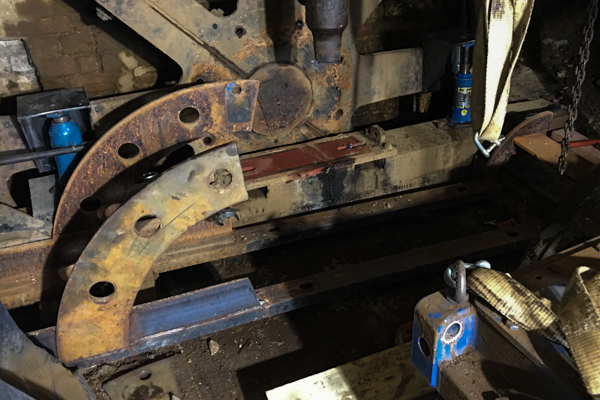 Steel runners and big curved metal brackets make sure that the gearbox can't lift up as the wheel turns. Hot on our bucket list is finishing this job. We have folk arriving tomorrow to make a film about the machining of the drive system they want to see "real milling" rather than five axis precision CNC milling. It's just an industry thing really. This is day four of waterwheel building. We've seven buckets in place and the last row of holes to drill on the seventh bucket. 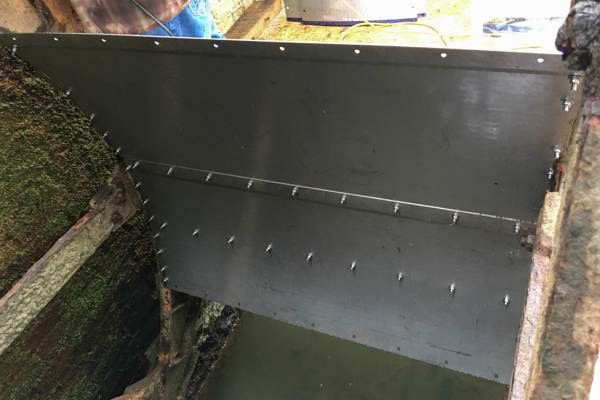 The location holes for the bottom edge of the buckets are already laser cut but the holes through the sole plates need to be drilled. Stainless steel work hardens very quickly and burnt out drills are a likely outcome if they are not drilled at the right feed rate and speed. In practice high-speed steel cobalt drills with a drop of lubricant do the job very well indeed provided the speed is slow and the pressure fairly high. It's a long job, the sole plates come laser cut as complete as possible but they need fettling to make them fit properly around the wrought iron spokes that support the cast iron wheels. 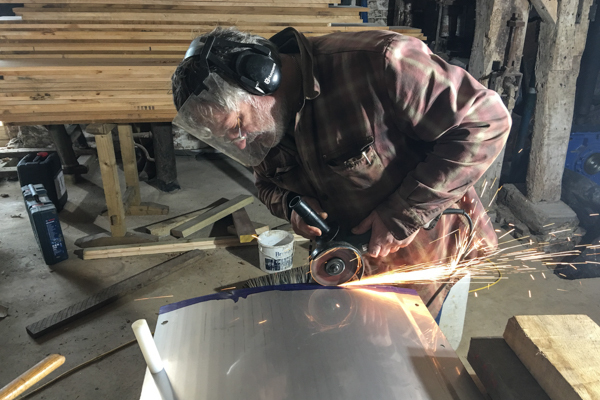 Here we are chomping a chunk off the edge prior to test fitting to mark out the bolt holes. 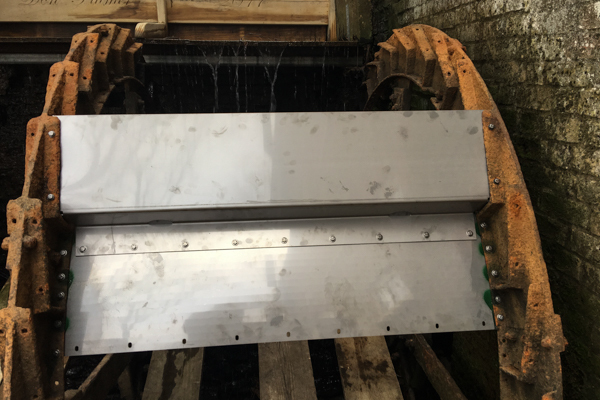 The stainless plates that form the inside of the waterwheel and make the bottom of the buckets are called sole plates.. These stack one above each other and are bolted in place with stainless steel bolts. The buckets are held onto the cast iron wheels and drilled and bolted into place on the shrouds. 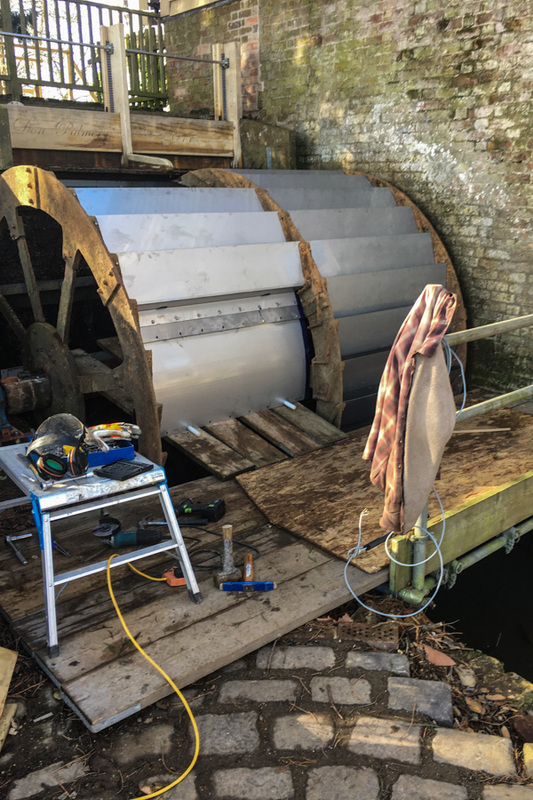 We now have control of the gearbox and that means we can move the waterwheel at will. Bucket fixing was the next task.